Sam* has a broad practice in complex commercial litigation, medical malpractice litigation and professional liability, appearing in all levels of court in Ontario and before various administrative tribunals. Sam navigates§ through complex issues of fact and law in order to put his clients’ best case forward. Sam ensures that he understands his client’s perspective and objectives, so that he can achieve the outcome best suited to each client’s unique circumstances. Sam believes that good advocates dispel complexity‡ by framing solutions in a simple, accessible and logical manner. Sam’s competitive spirit is not confined to the courtroom: when he is not focused on finding legal solutions, there is a good chance he is playing one of his many favourite sports. .
Sam has a broad and growing practice in complex commercial litigation, medical malpractice litigation and professional liability and regulation. Sam assists physicians in managing a wide array of interactions with their regulatory college. He frequently appears before the Superior Court and the Commercial List, a specialized branch of the Superior Court which handles complex commercial actions. 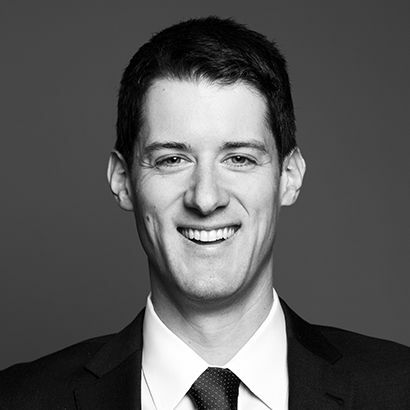 Sam also does appellate work and has been involved in a number of appeals before the Divisional Court and the Ontario Court of Appeal. Prior to being called to the Bar, Sam articled at the firm. During his articles Sam was involved in a variety of matters including construction litigation, disciplinary prosecutions, and securities litigation. While at law school, Sam participated in the IP Osgoode Intellectual Property Intensive Program. As part of this program, Sam spent a semester as a junior policy analyst in the Copyright and Trademark Policy Directorate, a branch of Industry Canada. Sam assisted policymakers in all aspects of their work, including the development of legislative amendments to the Trade-marks Act. At Osgoode, Sam volunteered with the Community and Legal Aid Services Program and the Law in Action Within Schools program. He also participated in the Lerners Cup moot. Counsel to the AJPO in a successful application for judicial review of the Ontario government's response to a judicial remuneration commission. An interim order was obtained that stayed the implementation of certain changes to the benefits of the Justices of the Peace of Ontario pending the hearing of the application.